Sometimes I can't help but indulge. A recent inheritance of dainty little teacups had me reaching for my camera to document their lovely beauty. Each day, I have at least two cups of tea. Maybe it's my British heritage or the fact that I grew up drinking tea, but I just gotta have it. A day without tea is a day without bliss. I have tea in the morning with breakfast and tea after dinner - sometimes afternoon tea at work. While I experiment with all kinds of teas (green, camomile, chai, mint) I always come back to my beloved orange pekoe. It's dark spiciness and full-bodied taste is unparalleled. With fall and winter coming, I'll likely only drink more. This one is my prize. 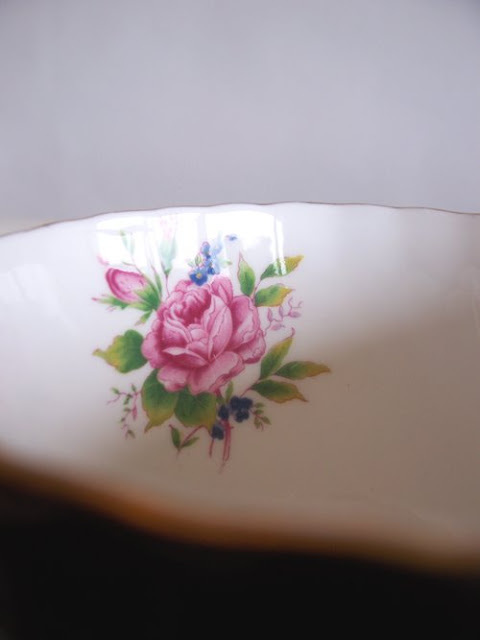 It belonged to my Aunt Ann and was her favourite teacup. It was made in Tuscany of fine bone china. 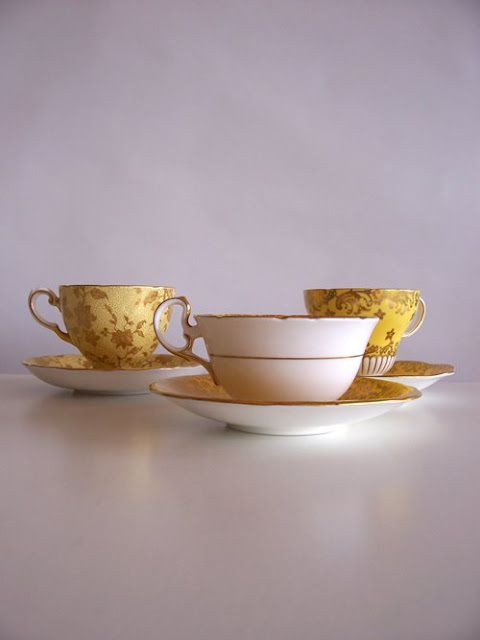 The Golden Girls - examples of Aynsley and Tuscan bone china from my "new old" collection. 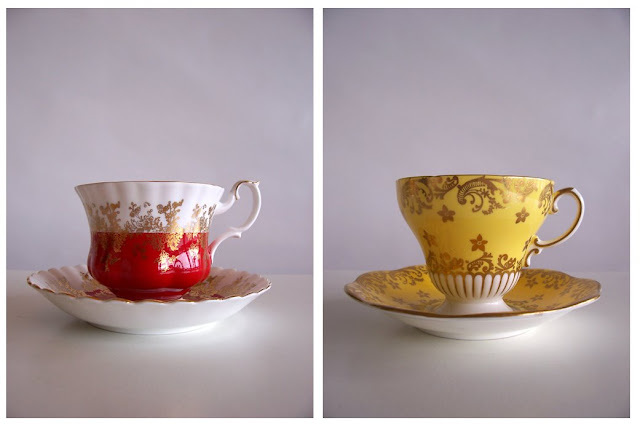 Royal Albert bone china teacup made in England on the left in red and gold. A Poley bone china teacup made in England on the right in yellow and gold. I love the detail on this Royal Albert example. The gold, white and red make it seem very Asian-inspired. Aynsley fine bone china, made in England. 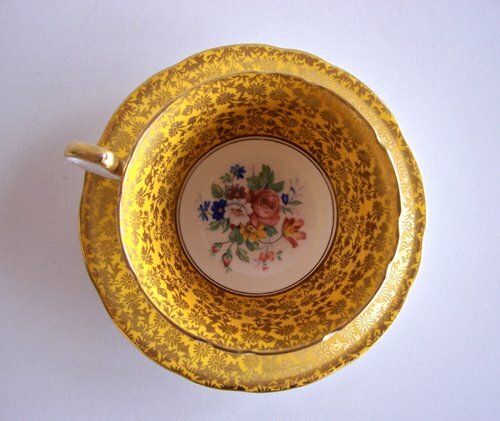 This black teacup is quite minimalist, adorned only with a gold rim and a tiny floral design on the inside of the cup. Aynsley fine bone china, made in England. 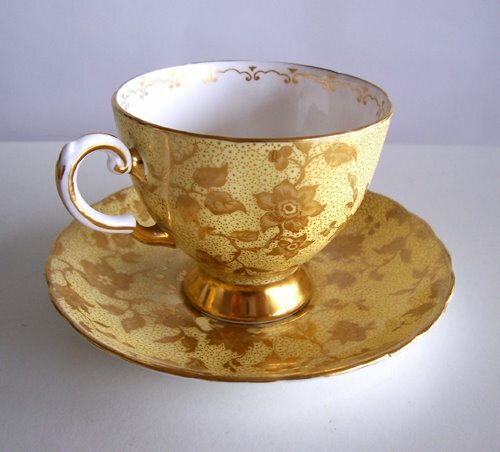 This one really shimmers and reveals a hand-painted floral design at the bottom of the cup. Early-Twentieth-Century writer George Orwell loved a good cup of tea. Here are some of his tips for the perfect cup. Start with cold water, which retains more oxygen for fuller flavor. If your tap water is hard, use filtered or bottled water. Preheat your teapot: While the water is heating, fill your teapot with hot tap water, let it warm, then drain it completely. Measure into the teapot 1 tsp. of loose tea for every cup you plan to pour. Some tea drinkers, especially those who take milk with their tea, add an extra spoon for the pot. If you're using a mesh tea ball, don't fill it more than halfway, to allow for complete expansion of the tea leaves. For black teas, bring the water to a full boil. Remove the teakettle from the heat as soon as the water begins to boil. Boiling all the oxygen out of the water will flatten the tea's flavor. For more delicate green teas, remove the teakettle from the heat before the water begins boiling, at 165-170 degrees F (74-77 degrees C). Or you can add 1 part cold water to 4 parts boiling water to cool it to the ideal temperature range. Before steeping, pour a small amount of the hot water over the tea leaves, to allow them to bloom, or open up, and release some of their bitter tannins. Drain immediately. Fill the pot with the boiling water. 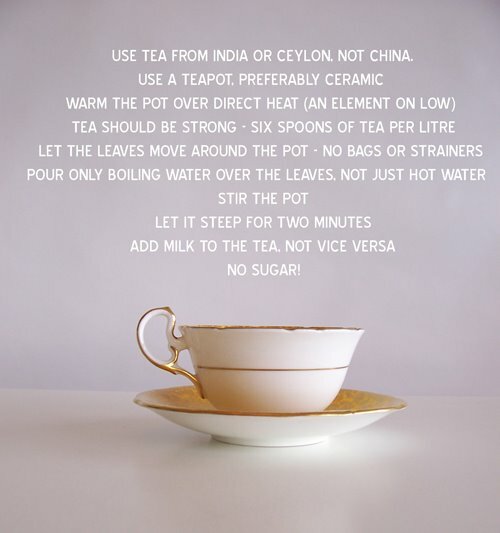 Keep the spout of the kettle close to the teapot, so the water does not cool as you pour it in. Cover the teapot and leave the tea to brew. In general, black teas are best brewed for 4 to 5 minutes; green teas should brew for no more than 3 minutes. When the tea is ready, pour and serve all the tea. 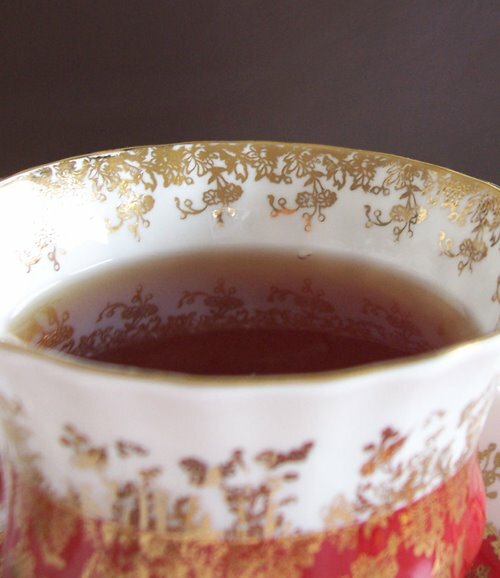 Avoid keeping leaves in contact with the hot water: Overbrewed tea tends to taste bitter. To keep the tea warm through several cups, transfer the tea to an insulated pot or cover your regular teapot with a tea cozy. Don't apply additional heat to keep the tea warm, as this will quickly degrade its flavor. A good-quality tea can be infused three to five times. Just add more boiling water. Let it steep for less time with each brew. The cups are beautiful. I was lucky enough to receive 2 of the tea cups from Martha's collection (Robin's Egg) after her failed attempt to come to England (as we had tickets Wedgwood kindly gave us the gift anyway). Do Canadians partake in 'Afternoon tea' like they do in England for special occasions. There is nothing nicer than getting the best china out for tea. Afternoon tea isn't quite as popular here, but it still happens. A lot of the big hotels in Canadian cities offer it as part of their service. Canada has a very large population of British immigrants and decendants (we're part of the Commonwealth) so tea is enjoyed here a lot! Oh, I'm a mug guy too, Kevin. 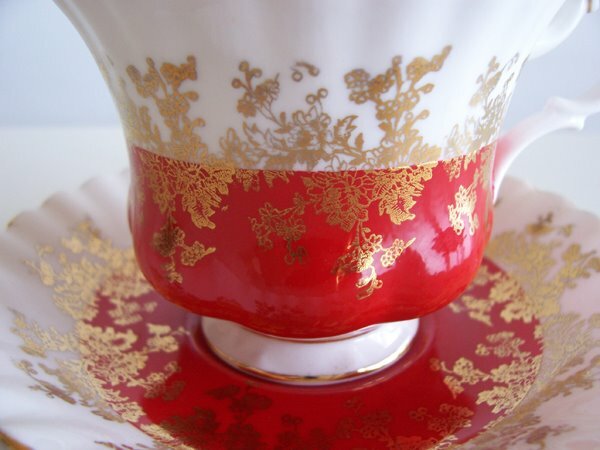 These teacups are strictly eye candy.